Nomination’s for Melbourne’s Lord Mayor, to replace Robert Doyle has now closed with 14 Candidates nominating for the Ring Master’s Head Clown. Below is a complete list of candidates in ballot draw order. Community activist and Lord Mayor Candidate Anthony van der Craats (The Light on the Hill Team) has called for a review of the La Trobe Street ‘closed lane’ bicycle path and the banning of bicycles along the Yarra Promenade..
Council has to restore two lanes of traffic along La Trobe Street to get traffic flowing again. To do this it either has to remove the existing bike path or remove the adjacent car parking along La Trobe Street. Outside peak hour less than 20 bicycles use Latrobe Street per hour. Mr van der Craats said that the Copenhagen closed bike lanes have not improved safety and that disabled, elderly and family computers Safety has been placed at risk as a result. There are better alternatives that cost much less and are better for all users. Swanston Street is a good example. The Northern end of Swanston Street has a painted line delineation that allows bicycles to travel outside the ‘car dooring zone’, it works, whilst the Southern end between Queensberry Street and Victoria Street is a commuters nightmare. Similar problems exist with the St Kilda bike lane opposite the Art Galley. Disabled computers visiting the Art Galley or Gardens can not park safely and as a result are being discriminated against. For the cost of the 330 metre St Kilda Road strip the Council could have installed a safer more user friendly ‘line delineated’ bike path all the way along St Kilda Road to the Junction. Mr van der Craats has also called for bicycles to be banned from the Yarra Promenade as they are a risk to pedestrian and public safety. It is only a matter of time before a serious accident occurs and the Council will be held responsible. Six months ago the Yarra North Bank walkway was not designated a shared bike path. Now, without consultation, signs have mysteriously appeared and speeding cyclist have turned it into a cyclist speedway. Council must review and rethink its policy. Other road users needs and consideration must be taken into account. The Council failed to consult other users most notably Disability advocates, the RACV and motorcycle users all who have been severely impacted on by a poorly design bicycle network. The Council only consulted bicycle users and held meetings in coffee shops. Alternative designs and solutions had not been properly considered. It is time to STOP THE WAR ON CARS and to properly manage Melbourne’s road network. MORE than 5000 new student places will be created over the coming years including four new schools in Melbourne’s inner-city. Education Minister James Merlino this morning announced work would start immediately on acquiring a site for a new primary school in Docklands, which would cater for between 450 and 500 students. The government will also identify sites for a primary school at North Melbourne, a primary and secondary school at Fishermans Bend, and secure a site to expand Albert Park College. “Melbourne is one of the world’s most liveable cities and we are making sure it remains that way by building new schools and upgrading existing schools for families in the inner city,” Mr Merlino said. “We know that enrolment growth right across Melbourne and Victoria is just extraordinary. By 2020, we will have one million students in Victoria. “Over the next five years we need to accommodate 90,000 additional students. We are seeing that pressure right here in the inner-city, in the growth corridors of Melbourne and in our growing regional cities. The government has identified five sites for the Docklands primary school and is expected to purchase land within six months. Mr Merlino did not rule out vertical schools for the sites and said public private partnerships would also be considered. There is no set timeline on when the school will open, but Mr Merlino said he anticipated it would be about two years. “We will move to purchase a site within six months and that will inform our budget process”’ he said. Inner-city enrolled entry boundaries will also be changed so Docklands families can send their children to Ferrars Street Primary School and University High School. Mr Merlino said the Andrews Government was going further than the Docklands School Provision Review and stage two of the Inner City Schools Package, released this morning. ALP member and candidate for the City of Melbourne today called on the City Council to invest in speeding up the roll-out of the NBN to the City’s residents and businesses. Mr van der Craats, an IT systems analyst, said that the City’s Residents and businesses are being left behind in the information revolution and that access to high seed internet connection is paramount for Melbourne. The NBN must be accessible to all parts of the City, including South Yarra, East and North Melbourne, Carlton, Parkville and Kensington. If the Federal Government is unable to give the City priority then it is up to the City Council to step in and invest in Melbourne’s infrastructure. A CAR congestion tax, including inner-city suburbs as well as the CBD, is guaranteed to destroy business and shopping, turning the city into a no-go zone. Drivers who have no alternative in crossing the city would be the victims of heavy price gouging. The taxes could range from $2 to $3 a trip, depending on how close drivers come to the CBD. Such a regressive tax would achieve nothing except to further frustrate motorists and commercial vehicle operators. The tax would strangle the city, not open it to commerce, as people turn to outer-suburban shopping centres; much to the cost of major retailers, such as Myer and David Jones. The Infrastructure Victoria proposal would be a disaster for a city already being strangled by Premier Daniel Andrews’s decision to tear up the contracts on the East West road-and-tunnel link that would have prevented the traffic chaos caused by cars turning off the Eastern Freeway where it meets Hoddle St.
Ironically, Infrastructure Victoria was created by the Andrews Government to “take short-term politics out of infrastructure planning’’. That hasn’t worked. He must reject what are the recommendations of his brainchild. Instead of proposing a tax that will become an impost on business as it drives motorists away, the government must open new arteries across the city. 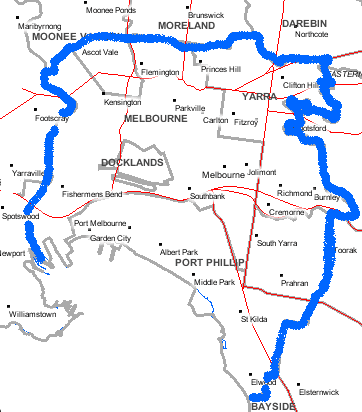 Not only must the abandoned East West Link be revived, the government must look towards a North East Link to connect the metropolitan freeway and tollway systems and a completed ring road around Melbourne. The Infrastructure Victoria plan, with its key proposals over the next 30 years, suggests offloading the costs to taxpayers when there are other ways to achieve access to a metropolis of the future. One of the reasons for a new pricing regime is the cost of future mega projects. The East West Link, which has already seen $1.2 billion of taxpayers’ money wasted on payments to contractors, has had a cascading economic effect, leaving Premier Andrews struggling to find an alternative to the second stage of the multi-billion-dollar project that would have eased congestion on the West Gate Bridge with a second Yarra River crossing. Premier Andrews ‘has already had the best day of his troubled two years’. A $5.5 billion proposal by CityLink operator Transurban comes at a cost of extending extend tolls on the system for at least a decade, as well as leaving the government about $2 billion short. Premier Andrews insists he has the money for this and the $10.9 billion Metro rail project running under Swanston St and the Yarra with five new stations. The cost has been spread over future Budgets, but what the government has failed to take into account is the cost blowouts in projects of this magnitude. Construction on the Metro project starts in 2018 but does not finish until 2026. The call for a wideranging and costly congestion tax can be seen as a recognition that money is likely to run out and motorists and commercial operators left to carry the burden. Premier Andrews has already had the best day of his troubled two years in government with the windfall of $4.5 billion to $5 billion on the 50-year lease of the Port of Melbourne. The $6 billion that was expected to come from the Port of Melbourne lease was to be spent exclusively on the removal of the state’s 50 worst level crossings; however, the government has already admitted to a potential blowout of $1 billion. The government has not been helped by being short-changed by the Turnbull Government under its asset recycling program. Federal Treasurer Scott Morrison says the program has closed and Victoria will get only $877 million, not the $1.4 billion it should receive after Mr Andrews promised the extra money from the Port of Melbourne lease would be spent only on transport infrastructure projects. But flagging massive regressive taxes on motorists is unacceptable and may bankrupt some city businesses and turn metropolitan Melbourne into a beleaguered fortress city. Federal Treasurer Scott Morrison says the asset-recycling program has closed. CAR-hating Greens have come up with a new tactic. The Greens are speeding up their campaign against cars by slowing them down, in policies being taken to the Melbourne City Council elections. Greens may wear suits but they are the tree huggers of old. Their war against cars, if it is to succeed, will drive business as well as cars out of the CBD. A speed limit of 30km/h and a congestion tax will destroy business, coupled with bike lanes along St Kilda Rd to the south of the city and Royal Parade to the north. Turning cars into a niche mode of transport and the CBD into a carless precinct is the Greens’ destructive aim. The 30km/h speed limit is the latest front in their anti-car strategy and includes a congestion tax to make it financially unviable to do business in the city. Motorists will avoid the CBD, taking their business and their custom to outer suburbs and leaving the city to pedestrians and cyclists. Immigrated to Australia in 1999. After a few years of working as a plasterer Sergey completed an additional legal study and was admitted to the legal practice in 2007. Access to Justice and customer ability to control and dispute a raising costs of a legal services is my primary area of the legal practice, as the costs lawyer trading under name of Victorian Legal Cost Assessors. Melbourne is a truly multicultural city. To be welcoming we need “Keep to the left” signs on all footpaths, and “We drive on the left-hand side in Australia”. Safe underground pedestrian crossings are needed for Melbourne’s streets. The 21st century requires a modern and innovative attitude to solve the challenges that are presented by an increasing and vibrant population. Safety and convenience are paramount for both pedestrians and traffic. The City has to be forward looking and nimble on its feet to maintain Melbourne’s status as the Most Liveable City in the world. The Council must work collaboratively with developers and entrepreneurs. Large buildings must contribute to the infrastructure that helps to make our jewel safe and improve quality of life for residents and visitors. We must look to other best case quality systems around the world, for example adopting the stricter Singaporean smoking and litter rules. Melbourne should be for Melbournians first and for investors second. The streets should be cleaner and the buildings more presentable with readable numbers clearly marked. City Council should not be a “rubber stamp”, but work with the innovators and all stakeholders in partnership to promote everyday real life improvements to make our city a better place. Driverless cars could be the norm within ten years. What does that mean for the City? We have to be ready and plan well now. More schools, childcare centres, other recreational and educational institutions to the Docklands and other areas of the City. Protection of the sport facilities and parks against over-developments and without proper infrastructure in place. You must number all teams in the Lord Mayor Leadership Ballot. O the Council ballot paper you can either vote above the line Just tick one box above the line) or vote for all 44 candidates below the line. I live in West Melbourne and have come to know and love the city, from the laneway coffee shops, to the city streets, parks and Victoria Market, which is about 150 metres from our front door. Council must be guided by the needs of the many, particularly those who call the city home. The decisions made now dictate not only the present, but also the legacy we leave for future generations. value of fighting for beliefs during the protracted battle which ultimately cleared my name. I work in Occupational Health and Safety for a Union and have post-graduate qualifications in that area. If elected, I will fight for transparency and sensible decision-making that will shape a brighter future for the treasure that is Melbourne. My email address is jmwrd1@gmail.com. Our team website is thelightonthehillteam.com.